Reimagine how you shampoo with this floral and woodsy-scented shampoo bar. Made with coconut oil, this handy little bar will get your hair shiny clean and keep it healthy. No harmful detergents or artificial chemicals. Why a shampoo bar? They're less messy and last longer. When using a shampoo bar, we recommend only shampooing with it 2-3 times per week. They also pack easily if you're constantly on the go. 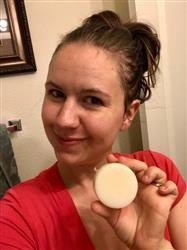 Comes as a 4oz shampoo bar. Ingredients: Coconut Oil, Safflower Oil, Glycerine (kosher, of vegetable origin), Sodium Stearate, Sodium Myristate (naturally occuring fatty acids), Essential oil blend, Sorbitol (moisturizer, sugar alcohol), Sorbitan oleate (emulsifier derived from sugar), Citric Acid, Oat protein. I have extremely greasy hair. With usual shampoos I get greasy by the end of the day. I can go three days with out shampooing when using this bar. I use the dry shampoo on the third day and it looks like the 2nd day with other shampoo methods. I would like other scents! I like the scent though, I am more likely to like citrus type smells. I have very sensitive skin and have been using this for about 3 weeks and have less irritation. I hope my skin stays less irritated. My boyfriend and I both use this shampoo bar on our dreadlocks and we love it. We will be ordering this amazing product again!! This is by far the best shampoo bar I have ever tried. This is my second one, and me and my hair still love it. The smell is outdoorsy with a feminine twist, just the right mixture. Love it.